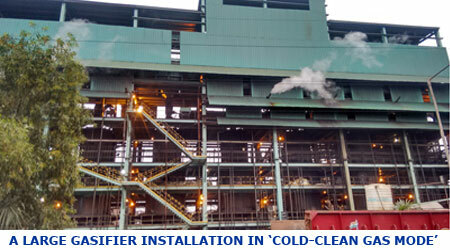 In ‘Cold-clean Gas Mode’, gas exiting from the gasifier is cooled and cleaned before being conveyed to the utilization equipment. Since the gas is to be cooled, it is attempted to utilize most of the sensible heat of gas within the gasifier reactor. Therefore, the gas is taken out of gasifier at minimum possible temperature. The gas is then cooled and cleaned utilizing an elaborate system consisting of coolers, scrubbers, filters, electrostatic precipitators, etc. The exact design and configuration of gas cooling-cleaning system depends upon the requirement of the application. Tar is separated, collected and sold or used in-house. It can be used either as a fuel or chemical feedstock. Water treatment is designed as integral part of the entire system. While the gasifier reactor efficiency is higher as compared to ‘hot gas mode’ due to internal heat utilization, overall system efficiency would be lower as sensible heat of gas is lost when it is cooled. Calorific value of cold gas is higher as it contains larger fractions of hydrocarbons. It would be in the range of 1250 – 1400 kcal/Nm3. Total energy content in cold gas would be lower than that in hot gas.